Search Results for "greek flag"
The national Greek flag is developing in the wind on the roof of the building of the Greek Parliament in Slow Motion. Statue of the great Greek philosopher Socrates on background classical columns and the Greek flag in slow motion. White buildings and windmills line the hillsides of the Greek Island of Santorini with a Greek flag in the distance. Multi colored houses line the hillsides of the Greek Island of Santorini with a Greek flag in the distance. Slow pan of white houses lining the hillsides of the Greek Island of Santorini with a Greek flag in the distance. White houses line the hillsides of the Greek Island of Santorini with a Greek flag in the distance. The White Tower area day view at Thessaloniki, Greece. Greek admiral Votsis bust visible with city and Greek flags waving. Northern Greece National Theater in background. Aerial of typical Greek church with Greek flag in the town of Parikia, Greece. Houses line the hillsides of the Greek Island of Santorini with a Greek flag in the distance. Panning shot of a Greek Orthodox Cycladic Church with a Greek Flag flapping in front of it. Low altitude foggy clouds move fast above the church because of the strong wind. Greek flag waving before blue sky background on a sunny day. Greek flag with blue and white stripes on a mast waving in the wind next to a tree. A Flag of Greece waving with the wind in an epic, dramatic and realistic way. A Greek flag. Greek flag with flags of the olympics. Football fan with the flag of Greece. Woman with a Greek flag and a soccer ball. 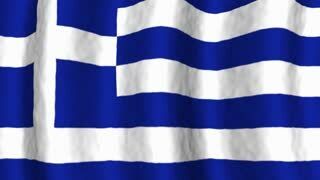 The Greek flag, flag in 3d, waving in the wind, on black background. Flag of Greece and football ball. Greek flag and ball on the grass. Flag of Greece on green grass. The Greek flag flutters in the wind. Flag of Greece and soccer ball. Greek flag and ball on the grass. Athens,Greece - July 2018 : The Athens International Airport "Eleftherios Venizelos" near the town of Spata. Greek flag, European Union flag and airport flag waving. The Greek flag, flag in 3d, waving in the wind, on sky background. Greek flag on the background of books. Flag of Greece and paper books, library. Greece waving flag. 3d Man holding and waving Greek flag on transparent background. Loop. Alpha channel. 4K. Greek flag - symbol of the country is animated.